Jürgen Moltmann (1926-) is a German reformed theologian and professor emeritus of systematic theology at the University of Tübingen. In his important work, The Crucified God (first released in German in 1972 as Der gekreuzigte Gott. Das Kreuz Christi als Grund und Kritik christlicher Theologie), Moltmann established the crucified Christ as the criterion of all Christian theology. Moltmann, with Luther, affirms that the cross is the test of everything which deserves to be called Christian (‘Crux probat omnia’). Theological reflection cannot start with abstract, philosophical ideas about God or systematic theories about sin, justice, predestination and so on, but must start with the cross. We know first of all God, not as the omnipotent creator and judge, but as the crucified Christ. When we let the crucifixion of Christ determine our theological concepts, this has radical and all-embracing consequences for how we view the relationship between God and human beings in general. Moltmann further argues, that putting the crucified Christ in center of Christian faith and theology, is the only way for the church to show the world the freedom from the forces of history and society that Christ offers. Moltmann’s The Crucified God also anticipates his version of a Christian universalism known from his later book The Coming of God. 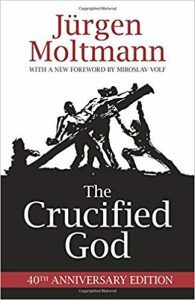 Moltmann, with Christoph Blumhardt, argues that the cross is “Christianity for all the world”, as the cross dissolves all distinctions between human beings, including those “between Christians and non-Christiand, the pious and the godless” (p. 280).